This video explains mechanisms of host plant resistance to herbivory and demonstrates a no-choice test that estimates the relative contributions of antibiosis and tolerance to spittlebug resistance in Brachiaria spp. Parsa, S., Sotelo, G., Cardona, C. Characterizing Herbivore Resistance Mechanisms: Spittlebugs on Brachiaria spp. as an Example. J. Vis. Exp. (52), e3047, doi:10.3791/3047 (2011). Plants can resist herbivore damage through three broad mechanisms: antixenosis, antibiosis and tolerance1. Antixenosis is the degree to which the plant is avoided when the herbivore is able to select other plants2. Antibiosis is the degree to which the plant affects the fitness of the herbivore feeding on it1.Tolerance is the degree to which the plant can withstand or repair damage caused by the herbivore, without compromising the herbivore's growth and reproduction1. The durability of herbivore resistance in an agricultural setting depends to a great extent on the resistance mechanism favored during crop breeding efforts3. We demonstrate a no-choice experiment designed to estimate the relative contributions of antibiosis and tolerance to spittlebug resistance in Brachiaria spp. Several species of African grasses of the genus Brachiaria are valuable forage and pasture plants in the Neotropics, but they can be severely challenged by several native species of spittlebugs (Hemiptera: Cercopidae)4.To assess their resistance to spittlebugs, plants are vegetatively-propagated by stem cuttings and allowed to grow for approximately one month, allowing the growth of superficial roots on which spittlebugs can feed. At that point, each test plant is individually challenged with six spittlebug eggs near hatching. Infestations are allowed to progress for one month before evaluating plant damage and insect survival. Scoring plant damage provides an estimate of tolerance while scoring insect survival provides an estimate of antibiosis. This protocol has facilitated our plant breeding objective to enhance spittlebug resistance in commercial brachiariagrases5. Single stem cuttings from mature plants are used as experimental units. The cuttings are trimmed to 10 cm to ensure uniformity of planting material. To prevent contamination by plant pathogens, the cuttings are washed in a 3 % sodium hypochlorite solution for 2 min and then rinsed thoughroughly with tap water. Each cutting is planted in ca. 36 g of sterile soil in a cylindrical PVC tube (5.3 cm outside diameter by 6.5 cm height) sealed at the lower end with a Styrofoam cup and capped with a PVC bushing. The cutting is held in place by a foam ring placed in the central opening of the bushing. Plants are fertilized and watered as needed to maintain adequate soil moisture. Plants will grow for one month before being challenged by insects, allowing development of superficial roots, which serve as feeding sites for the root-xylem-feeding spittlebug nymphs. PVC tubes with rooted cuttings are inverted for 8 d prior to infestation to stimulate further the growth of superficial roots, partially adjusting for inherent differences in root architecture. This step requires an artificial source of light, which we provide for 24 h a day. To avoid confounding escapes from herbivory with herbivore resistance, individual plant replicates with few or no superficial roots after this inversion treatment are eliminated from the experiment. This elimination should be infrequent, never leading to the elimination of the genotype they represent. Adult spittlebugs are collected from the field, identified to species, and introduced to oviposition cages where they are provided foliage of susceptible brachiariagrasses to feed on. Females lay their eggs in soil contained in a shallow removable tray placed on the bottom of the cages. After several days, the soil is suspended in water and passed through a series of sieves (42, 60 and 150 mesh) to collect the eggs. Suspending the sieved material in a 30% saline solution causes the mature eggs to float, leaving behind immature eggs and any residual organic matter. To prevent contamination by insect pathogens, eggs are disinfected in a 0.5 % sodium hypochlorite solution for 5 min and then rinsed with distilled water. Each test plant (experimental unit) is infested at the soil surface with six mature eggs. Only mature eggs close to hatching are selected for infestations. They can be identified by the presence of two red dots in their anterior part, corresponding to the insect’s eyes; pink marks in their posterior part, corresponding to the insect’s abdomen; and a fully-expanded operculum. Successful hatching is confirmed 4 d later, at which point any unhatched egg is replaced by a neonate spittlebug from our colony. Test plants are arranged in a randomized complete block design with six replications per genotype. The experiment is evaluated ca. 30 d after infestation (exact times vary depending on the insect species studied). 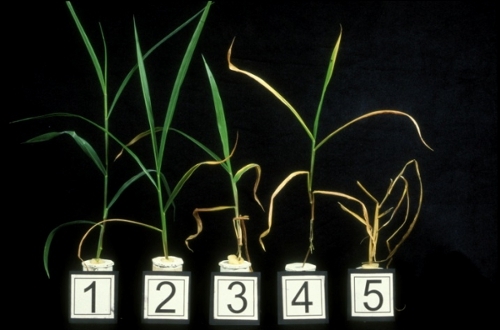 Damage is scored on a 1 to 5 visual scale, where 1 corresponds to no visible damage and 5 corresponds to a dead plant (Figure 1). Scoring plant damage provides an estimate of tolerance. Figure 1. Damage scale used to assess tolerance to spittlebug herbivory in Brachiaria spp. 1 = no detectable damage; 2 = 0-25% necrotic foliage; 3 = 25-50% necrotic foliage; 4 = 50-75% necrotic foliage; 5 = 75-100% necrotic foliage. 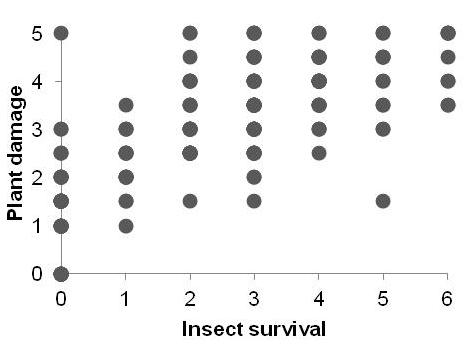 Insect survival is assessed by counting the insects reaching either their final instar or adult stage (Figure 2). Scoring for insect survival provides an estimate of antibiosis. Figure 2. 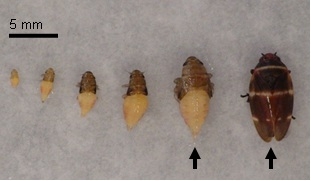 Spittlebug development from first-instar (left) to adult (right). Only insects reaching at least their final instar (arrows) at the date of evaluation are counted as "survivors." Results from a representative assay screening Brachiaria hybrids for resistance to the spittlebug Aeneolamia reducta are presented in Figure 3. Figure 3. Results from screening Brachiaria hybrids for resistance to spittlebug Aeneolamia reducta. We consider plants resistant if their response to herbivory falls in the bottom half of this plot. Antibiosis increases from right to left and tolerance increases from top to bottom. The arrows point at our resistant checks. Discriminating among herbivore resistance mechanisms can illuminate crop breeding efforts3. Resistance based on strong antibiosis could, under some circumstances, create selection pressures for more aggressive pest biotypes. On the other hand, resistance based on tolerance could allow pest populations to increase until tolerance eventually is overwhelmed. Breeding for durable resistance, therefore, requires careful consideration of what resistance mechanisms would confer most stability for a particular crop/pest system [see Kennedy et al. (1987) for a comprehensive discussion on the topic]3. This video demonstration builds upon several previous studies designed to estimate the relative contributions of antibiosis and tolerance to spittlebug resistance in brachiariagrasses6-9. In contrast with choice tests or field experiments, no-choice tests ensure all plants receive the same herbivore pressure, thus providing control for differences arising from herbivore behavior (e.g., host preference, aggregation). For this reason, however, no-choice tests are unsuitable to assess resistance by antixenosis. Artificially rearing insect colonies is the preferred method to obtain test insects for resistance screening assays10. Colonies provide a dependable and uniform source of spittlebugs of a known age for experiments to be conducted any time of the year11. It may, however, be necessary to periodically infuse wild individuals into the colony to ensure that the colony does not deviate genetically from relevant field populations10. To assess the fitness of these artificially-reared herbivores, and monitor possible changes in their aggressiveness over time, it is important that all screenings include suitable checks of known resistance levels. Multiple parameters must be carefully defined to design an appropriate resistance screening assay. A few key parameters we have considered to design our test include the age of the host plants, the species and developmental stage of the spittlebugs, the infestation level, and the duration of plant-insect contact8,9,12. Several rounds of experimentation and protocol refinement may be needed to reach to a rapid, cost-effective, reliable, assay that adequately predicts herbivore resistance in the field. This production and the experimental work presented herein reflect the devoted and enthusiastic help of Reynaldo Pareja kindly supported by Lina Aguirre, Gilberto Córdoba, William Mera, Ximena Bonilla, and Darío Viveros. We also thank John Miles and three anonymous reviewers for comments that helped us improve the video and manuscript. Painter, R. Insect resistance in crop plants. Mcmillan. (1951). Kogan, M., Ortman, E. Antixenosis-a new term proposed to define Painter's 'Nonpreference' modality of resistance. Bull. Entomol. Soc. Am. 24, 175-176 (1978). Kennedy, G., Gould, F., Deponti, O., Stinner, R. Ecological, agricultural, genetic, and commercial considerations in the deployment of insect-resistant germplasm. Environ. Entomol. 16, 327-338 (1987). Holmann, F., Peck, D. Economic damage of grassland spittlebugs (Homoptera Cercopidae) in Colombia: a first approximation of impact on animal production in Brachiaria decumbens. Neotrop. Entomol. 31, 275-284 (2002). Miles, J. W., Cardona, C., Sotelo, G. Recurrent selection in a synthetic brachiariagrass population improves resistance to three spittlebug species. Crop Sci. 46, 1088-1093 (2006). Ferrufino, A., Lapointe, S. L. Host plant resistance in Brachiaria grasses to the spittlebug Zulia colombiana. Entomol. Exp. Appl. 51, 155-162 (1989). Lapointe, S. L., Serrano, M. S., Arango, G. L., Sotelo, G., Cordoba, F. Antibiosis to spittlebugs (Homoptera: Cercopidae) in accessions of Brachiaria spp. J. Econ. Entomol. 82, 1764-1766 (1992). Cardona, C., Miles, J. W., Sotelo, G. An improved methodology for massive screening of Brachiaria spp. genotypes for resistance to Aeneolamia varia (Homoptera: Cercopidae). J. Econ. Entomol. 92, 490-496 (1999). Cardona, C., Fory, P., Sotelo, G., Pabon, A., Diaz, G., Miles, J. W. Antibiosis and tolerance to five species of spittlebug (Homoptera: Cercopidae) in Brachiaria spp. : implications for breeding for resistance. J. Econ. Entomol. 97, 635-645 (2004). Smith, C., Khan, Z., Pathak, M. Techniques for evaluating insect resistance in crop plants. CRC Press. (1994). Lapointe, S., Sotelo, G., Arango, G. Improved technique for rearing spittlebugs (Homoptera: Cercopidae). J. Econ. Entomol. 82, 1764-1766 (1989). Lopez, F., Cardona, C., Miles, J. W., Sotelo, G., Montoya, J. Screening for resistance to adult spittlebugs (Hemiptera: Cercopidae) in Brachiaria spp. : methods and categories of resistance. J. Econ. Entomol. 102, 1309-1316 (2009). CONGRATULATION TO ALL , THIS IS GREAT!!!!!!! !, KEEP THE GOOD WORK!! !